Monde Selection is the most renowned quality award founded in Brussels in 1961 and is an annual reward that has garnered its popularity among companies around the world. This prestigious award has been inviting international experts to taste, try and test around 3,000 products ranging from food, drinks, diet and health products, etc. Every year more than 70 international experts test products from more than 80 countries. For Diet and Health category, independent experts such as nutritionist, chemists, and university professors are invited to evaluate the submitted products based on a variety of parameters. After the various tests and tastings, the juries of Monde Selection award Bronze, Silver, or Gold to products that are outstanding. Gold Award in 2017 and 2018! 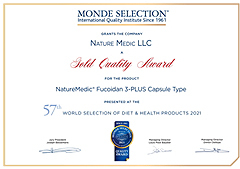 Nature Medic was the only Fucoidan brand in the world that received the gold medal for its Capsule Type product in 2017. Consecutively in 2018, Nature Medic is proud to receive Monde Selection Gold Medal for Liquid Type product. Here at Nature Medic, we always strive to provide you with the highest quality products and exceptional customer satisfaction. 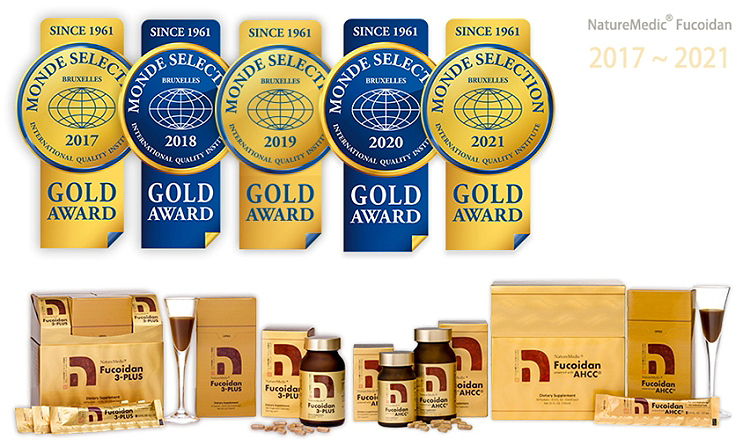 The Gold Medals we have received from the world’s best quality award, Monde Selection, show our company’s commitment to delivering excellence in quality products.